We know so many of you want to learn in your own time at your own pace, anywhere with a book to browse through, learn from, and make notes on. ITS Correspondence courses are designed to suit you. Book online, we dispatch within 48 hours of receiving payment, you complete at home or work when it suits. Choose ITS Correspondence if you want to upskill to get ahead at work or get the skills you need to get the job you want. ITS all sorts of courses for all sorts of people. We offer correspondence courses to students located anywhere in New Zealand. Become a certified manager in a licensed premise. This course is NZQA unit standard based and covers the LCQ - the training and certification you need in order to apply for a Manager’s Certificate. Essential training for all food handlers - this course meets the compulsory training requirements of all food handlers under the Food Act 2014, from market stalls, cafes and restaurants to senior living and early childhood education providers. Including assessment to NZQA unit standard 167 - this practically assessed basic food safety course meets the compulsory training requirements of all food handlers under the Food Act 2014. You do need to be in a workplace to be able to complete this assessment. Including assessment to NZQA unit standard 20666 - this theoretically assessed basic food safety course meets the compulsory training requirements of all food handlers under the Food Act 2014. This course is perfect for supervisors, managers, business owners, sole operators or anyone who wants to learn about managing food safety in their business. It is a very practical look at the food handler and their responsibilities under the Act, including how to manage food safety hazards and work under a food control plan. Including assessment to NZQA unit standard 168, this course includes essential knowledge of food contamination hazards and how to control them, and looks at the logistics of working under a Food Control Plan. It is perfect for supervisors, managers, business owners, sole operators or anyone who wants to learn about managing food safety in their business. An upskilling opportunity to build your knowledge of basic culinary products and terms used in the industry today; this course will also look at the logistics of working under a Food Control Plan. It is a perfect upskilling opportunity for staff working in a food business who want to develop into supervisors or managers and gain NZQA unit standards to add to their CV at the same time. This retail course will teach you why it is important to have great product knowledge, and will also take you through what theft and fraud could look like in your workplace. Welcome to Industry Training Solutions. We are New Zealand’s number one training provider. hence we have over 18 years of experience in hospitality training. We provide training for public & private organisations and schools. In addition, we offer other amazing fun-filled courses. All sorts of courses for all sorts of people. Our main focus is to provide Quality LCQ, food safety & coffee courses. You can also complete self-paced courses in your own time. Have you ever wanted to work in a bar or in a customer service environment? Come and complete your LCQ training today with our fun and friendly tutors that inspire learning. Prices starting from just $179. Essential food training for all food handlers. This course meets the compulsory training requirements of all food handlers under the 2014 food act. Prices starting from $130 for our basic food safety package. Want to learn how to make a great tasting coffee in a day? Come see us. No experience needed, we will teach you how to use an espresso machine. One day fun day course with prices starting from $175. Need to gain some skills but don’t have time to attend courses? Upskill by completing study at home and gain knowledge recognition and NZQA credits. For example, in 8 weeks (average time) you can complete a Basic Food Safety (BFS) or Comprehensive Food Safety (CFS) course. Work through the workbook and then send completed assessment for marking. Any incorrect response will be returned to you to resubmit for marking. 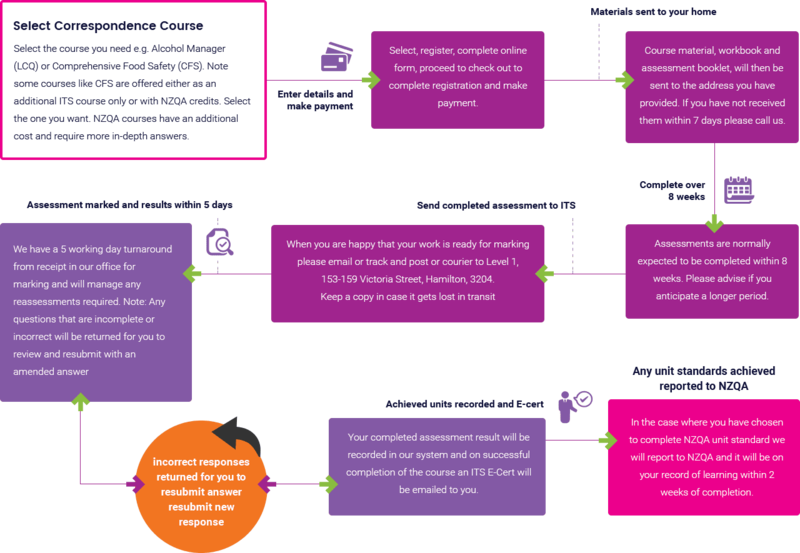 On successful completion, you will be sent an ITS E-Cert and where appropriate NZQA will be notified of your results and the credits added to your record e.g. 4 level 2 credits for BFS or 4 level 3 credits for CFS. You may be at home, but you are not alone with support, assistance or any help is only a phone call or email away.